Elegant free-form amber art glass brings an organic touch of beauty to this golden bronze bath light fixture. 29 1/2" wide x 12" high. Oval wall plate is 8" wide x 4 1/2" high. Each glass shade is 5 1/4" high. Extends 8" from the wall. 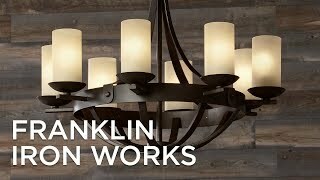 Bathroom vanity wall light by the Franklin Iron Works™ brand. Scroll frame is in a golden bronze finish with silver finish accent highlights. Free-form, hand-blown amber toned glass. It's pretty. The good reviews. It works for our 1/2 bath. It's unique. For the look after an order from Wayfair was back ordered. It's gorgeous and the back plate hopefully is wide enough for my current light box. Looks very elegant and artistic. Especially like the glass. I'm not using it in the bath, however I'm using it in a hallway where it will fit nice and will match the other amber lights. Beautiful unique glass art! Goes perfectly with our antique vanity. Can’t find anything like this anywhere else. Love it! We have the same lite ( yet a 5 lite design ) in another bathroom. Beautiful lite, great design. Not your everyday lighting style. Already have one and love it! Can’ wait to get to go into our newly remodeled bathroom. Loved the look and reasonable price. Goes well with my amber vessel sink! should look great in my remodel bathroom. They are very classie and unique. I am trying to match the oil brushed bronze facet and fixture in my new bathroom. The products are Moen. Does anyone know if this bronze is a match or close to a match to Moen? BEST ANSWER: Unfortunately, every manufacturer has their own versions of bronze. But they may look very similar and compliment each other. We have the oil rubbed bronze Devonshire faucet made by Kohler. We purchased this light fixture to go with the oil rubbed fixtures; they look great together; they compliment each other very well. .
No it won’t match as it really isn’t bronze. It will compliment the bronze though. I have bronze fixtures and it looks fine. My bulbs usually get stuck due to rust from moisture will these ones do that? BEST ANSWER: This bathroom light is rated for damp locations. But, if you have excessive dampness in your bathroom, we suggest adding an exhaust fan to help alleviate your sockets from rusting. The description says the fixture is bronze with silver accents. Where are the silver accents? I cannot see them in the picture. BEST ANSWER: There are "glints" of silver, but not many. It's mainly bronze. Thanks! My mirrors are made by an artist and they're brushed silver with bronze leaves inset. I hope this goes will with it! My granite is creams, greys, blacks and browns with some white. It's more like a bronze with a light silver glaze. Thank you Beverly j! That sounds interesting! I just hope it blends with my artistic steel with bronze mirrors! Most of my other accents are brushed nickel but I'm picky about style and I liked this after my Wayfair order got back orders for months! Now - hang it up or upside down? We hung ours with glass up in our master bath because we have the matching chandelier in our bedroom. Beverly - I bet that's beautiful! Wonder if they make the bedroom light with a fan? Can I buy 8 of the glass shades only? BEST ANSWER: Our customer service team would be happy to assist you with any product issues. They can be reached via chat or phone (800-782-1967). how much does this fixture weigh? BEST ANSWER: Hi - This weighs approximately 12 pounds. What type of electrical box is used for this light (hex, round ) ? BEST ANSWER: I purchased this approximately18 months ago, it is installed on a round box. Are the fixtures UL listed? BEST ANSWER: Hi - This is UL and CUL listed. Excellent they are beautiful fixtures I plan on purchasing some thank you very much!! Don’t know for sure, but can’t imagine LampsPlus selling some that wasn’t. I can tell you I have this one, plus two others from the collection (my daughter has three more) and neither of our houses have exploded or burned up in a year. They work beautifully & look gorgeous in both our homes! Highly recommend! Can LED bulbs be used instead of the standard 60 watt bulbs? BEST ANSWER: Yes, I have LED lights in mine now. As long as they have the regular light bulb base. What are the dimensions of the cover plate? BEST ANSWER: Hi, the base plate measures 8"W X 4.5"H.
Does this same light come 3 lights rather than 4? BEST ANSWER: Hello - a three light is not available in the collection. Not that I’m aware of-I believe all options are online to see but would suggest you contact customer service they are very helpful. Good luck. Are the glass shades removable? What is the diameter of the base of the glass shade? BEST ANSWER: Yes, the glass shades can be replaced. The opening of the glass shade fitting is 1 5/8" inches. Can I use regular (non LED) 25 watt bulbs? BEST ANSWER: Yes, regular 25 watt is perfect. I use GE Crystal Clear 25 watt decorative bulbs (G16 1/2 bulbs). Yes, you can use regular bulbs. I use the Edison Vintage bulbs, non LED. What are the measurements of the oval wall mount plate that attaches the fixture to the wall? BEST ANSWER: approximately 8.5" x 4" Really pretty fixtures. Used Edison Bulbs(warm clear) in the various fixtures we got and provide a very pretty effect. Good luck. Are the globes made of thick glass that's not easily broken? BEST ANSWER: The glass shades are pretty thick. Can this be hung with lights facing down? BEST ANSWER: Dear Debbie: my husband managed to hang it with lights facing down, but he had some difficulties. He is very handy man and he finally attached it to the wall, but it took additional time and work. It looks great with lights facing down. I hope it is helpful information. Best regards. ABSOLUTELY!!!!! Mine are facing down in my master bathroom. Works perfectly and are beautiful! I've gotten so many compliments on these lights!!!! You will love them!!!!!!!!! Yes it can, but i feel it looked better facing upwards. Hope this helped, It's a great beautiful light, we bought 2-4 tier and 1-5 tier. Looks amazing! Yes, that's how we have it. We use a 100 w equivalent led bulbs to stay under the voltage limitations and still have brighter light. Absolutely - I have them hung that way in both bathrooms. Gives off a lovely shimmering light. I recommend 25 watt light bulbs. Yes, we actually did hang it facing down to accommodate the mirror. It looks very nice. Would definitely recommend it. Yes it can! I get lots of compliments on this light fixture. Yes, this fixture can be hung with the lights facing down. Yes, we have it with the lights pointing downward. 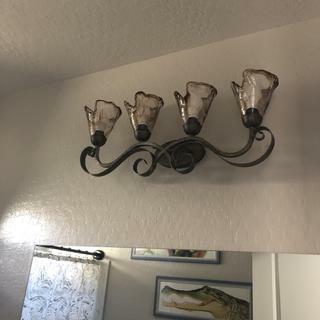 I put this beautiful fixture in my bathroom. It is truly a statement piece. All who go in there now usually always say something about the beauty of it. Received it quickly and installation was easy. This is a gorgeous fixture and not like others I have seen in lighting stores or online. I hung this one in a finished basement bathroom with the glass pointed down. I also purchased two matching single light pendants that are hung over the bar. I have received many compliments. Would definitely recommend! Love unique things for my home this is sooooooooooo special. i would recommend these to make your bathroom look elegant but casual. We were looking for a cosmetic upgrade to match our new tiled showers and tubs in 3 bathrooms - this light fixture looks great, very high end and high quality. Delivery was prompt and the lights arrived safely -- they were well packaged. A better quality then you local do it yourself store! Also found matching above ceiling light. I am using them in a somewhat rustic bathroom. the lights are on a stairway. they look beautiful! Not too much, as far as looks, it is just right. They bring a sense of elegance to our guest bathroom. A great addition! A light like no other. This light stands out in our bathroom and is like a piece of artwork. This bathroom light fixture looks amazing in my bathroom. It looks very elegant & very bright. It comes out from the wall a little further than some light fixtures which looks great and makes it stand out. Absolutely amazing. More beautiful in person! Absolutely beautiful. Arrived in perfect condition. I will be back for the 5 light in the near future. The vanity light fixture was an excellent choice for a guest bath in our updated 1904 Victorian home. Putting amber 40watt LED lights and hanging it with the shades downward really perfected the look and complimented the lighting making refections most pleasing . I didn't pay attention to the size of the glass shades, they are much bigger than I anticipated but by the time I get a new medicine cabinet they will look even more beautiful, very impressed, Love Lamps Plus !